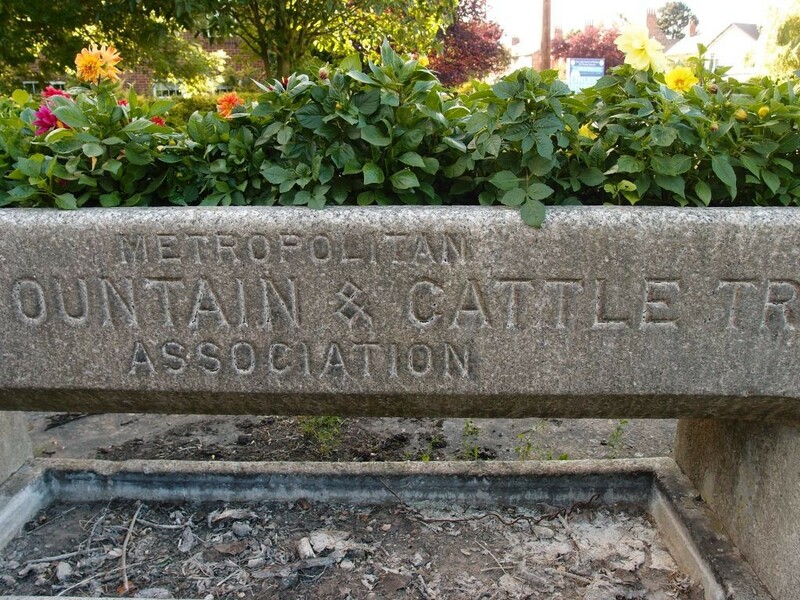 If you were accompanying me on the previous page’s wander you’ll know that we’d reached the cattle trough, and no doubt hundreds of readers have been eagerly awaiting further cattle trough news. 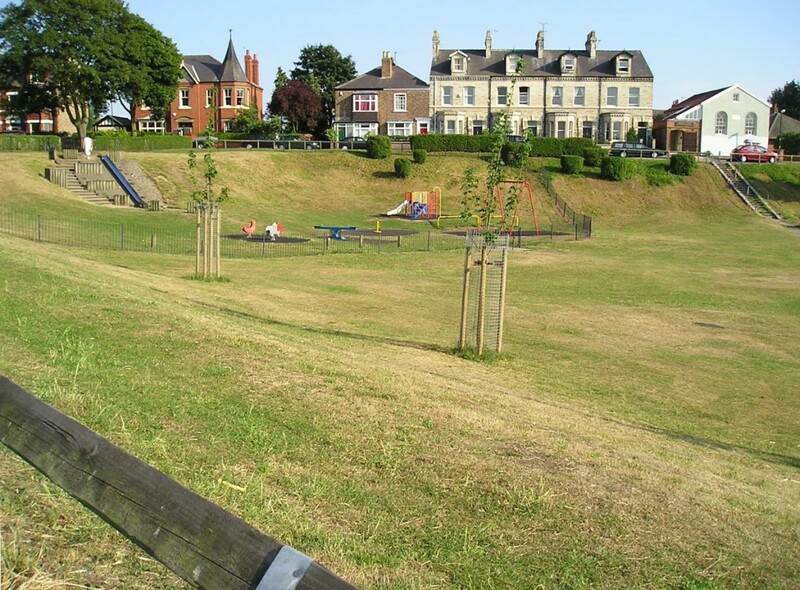 There it is, above, pictured in 2006, for the original page about Acomb, which we’re revisiting ten years on. I took a photo of it because I remembered it, and found it an interesting relic of past times. I thought I remembered it full of flowers, back in the 70s and early 80s. 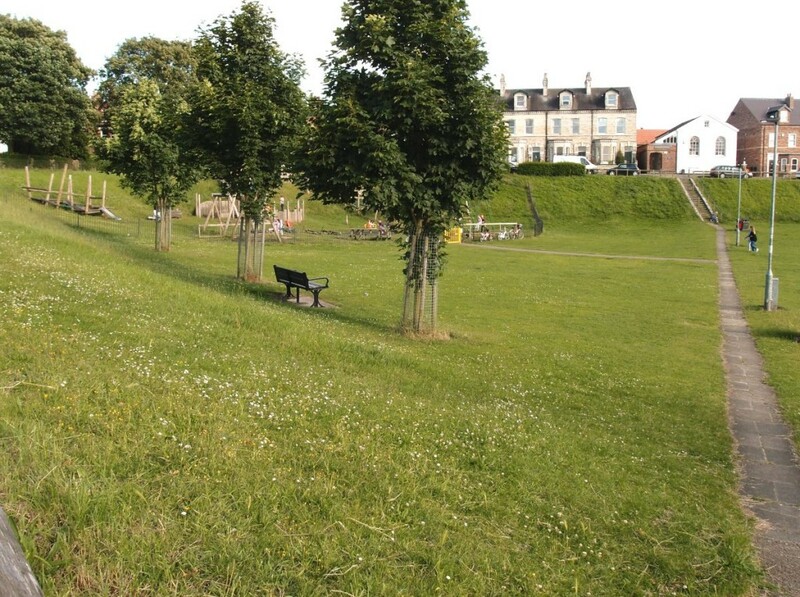 In 2006 the only greenery was the weedy growth at its base. The mystery deepens. I’m curious, and would like to know more, because things like this form the stories of a place, and its character, and I feel like this walk of 2016 brings me to a better understanding of the place, more than I had on my 2006 wander and more than I had when I grew up here, decades back. Or perhaps just a different understanding, more layers. 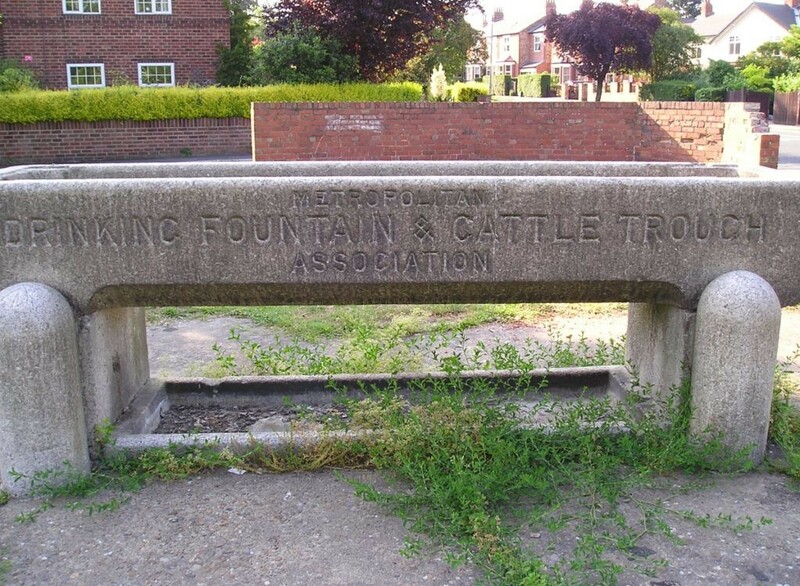 Anyway, let’s stop gawping and wondering at the cattle trough, and stride purposefully across the patch of grass near it (is this also a part of Acomb Green, though not seen as such?) 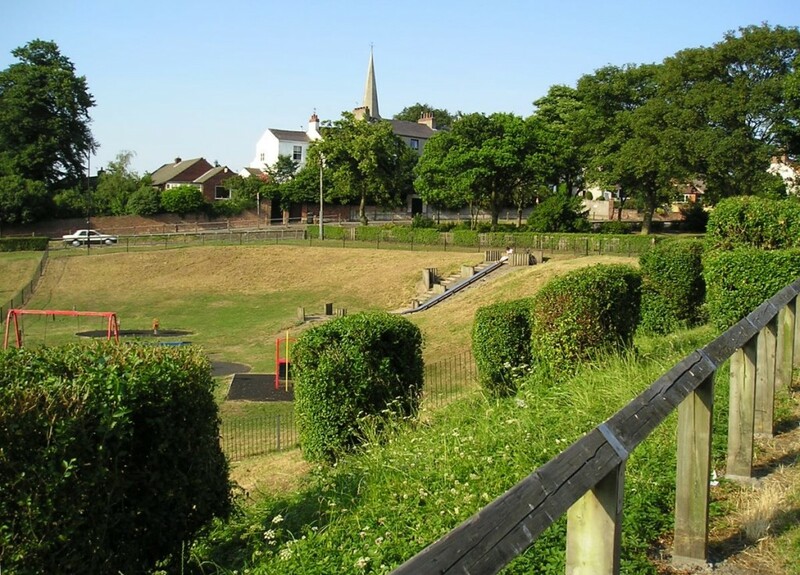 towards the corner of the fenced triangle of land we know as Acomb Green. A quick snapshot that meant something to me as I remember sitting here with friends on summer evenings, decades back, when we were teenagers, passing time chatting and messing about and staring out onto the road ahead and thinking about the road ahead in terms of when we could get out into the big world beyond Acomb and not have to be back home by the times our parents told us we had to be back home. It’s pretty much the same. 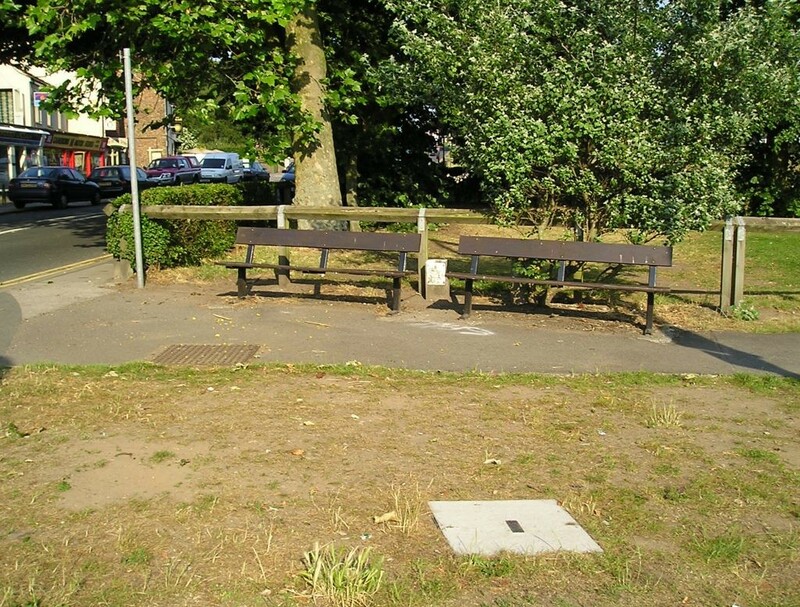 The benches haven’t been replaced yet with the approved standard design of bench as so many others have, and I note this approvingly, as I’m much older now and pay council tax and care about what it’s spent on and don’t want it spent on pointless bench replacement. Does anyone even sit on these anymore, I wonder. 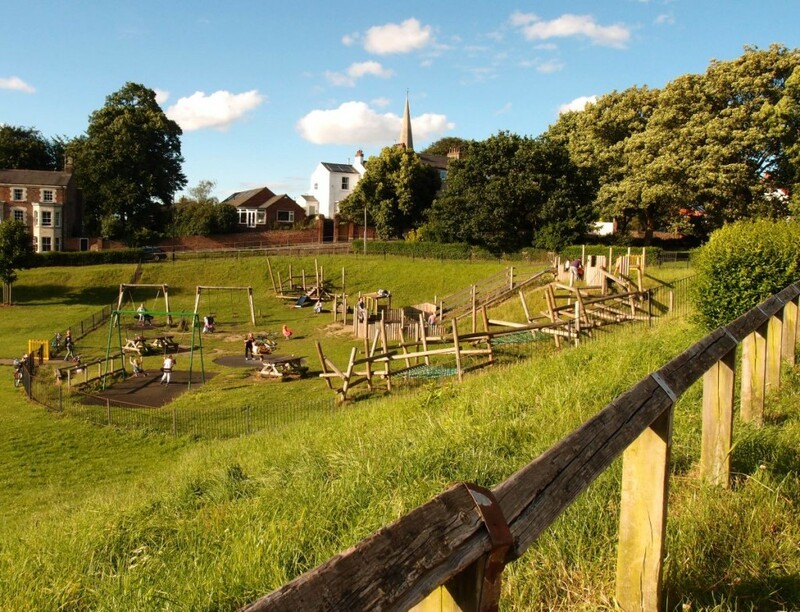 Anyway, we’re supposed to be visiting the Green, so let’s move along, along the perimeter of Acomb Green, by its wooden fence, to the view from its edge near the Sun Inn. 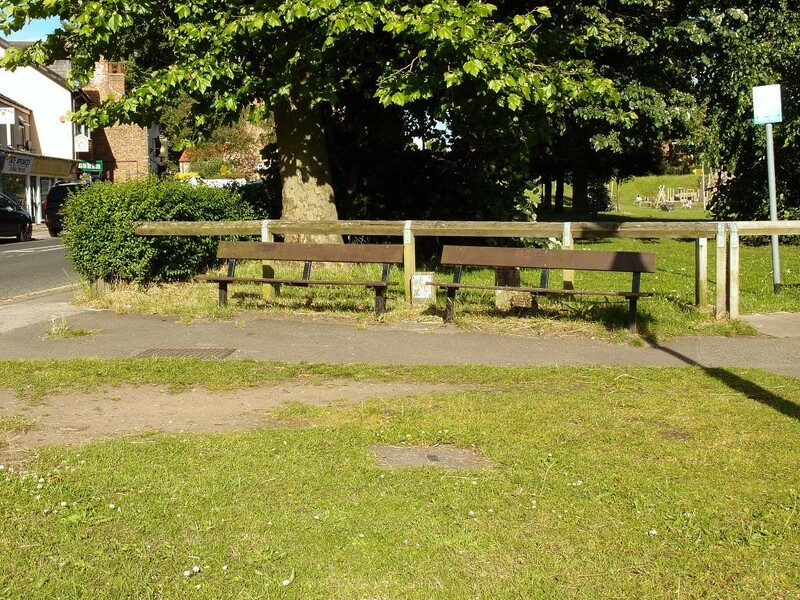 The main change is in the playground equipment: back then all painted metal, painted in cheery colours but with large spaces between each playground ‘attraction’, and perhaps not massively attractive to a 21st century small person in search of entertaining play. Now there’s play equipment in wood making better use of the space. Looking very popular. 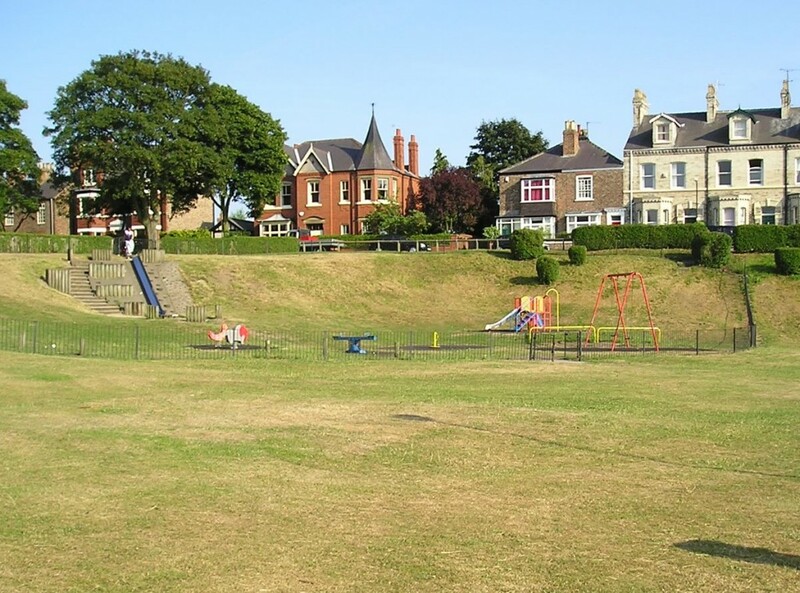 It probably needs to be mentioned that when I took the photos on 3 July 2006 that was a weekday evening, a Monday, and that the revisit this year on 3 July was a Sunday, which I imagine has some bearing on it, on how many people were on Acomb Green. It was busy, this sunny Sunday evening. With not much changed. The same weeds grow in the cracks, softening the concrete. 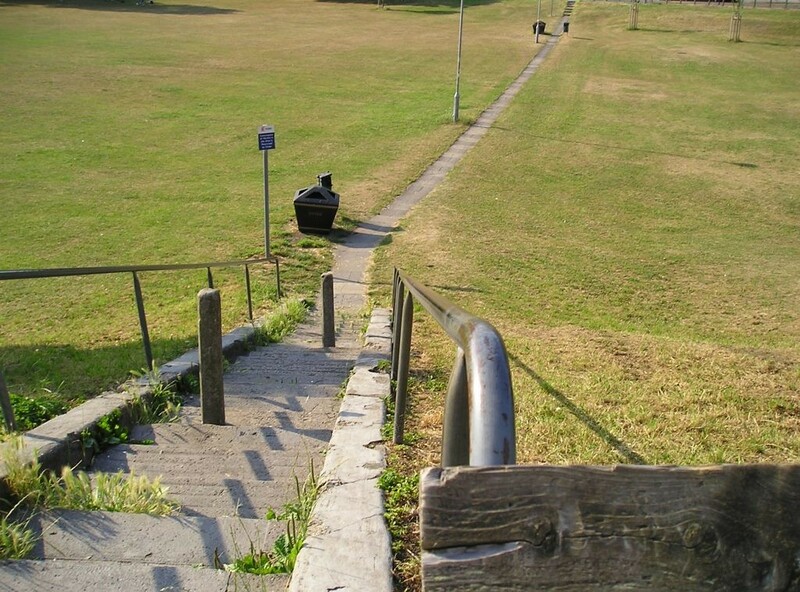 But I notice more now than I did then, and wonder why those concrete bollards are there, in the flight of steps. I wonder if they’re supposed to be a help, for leaning on perhaps if you get tired on the way up. They seem like more of a hindrance. Beyond them, the small chapel. 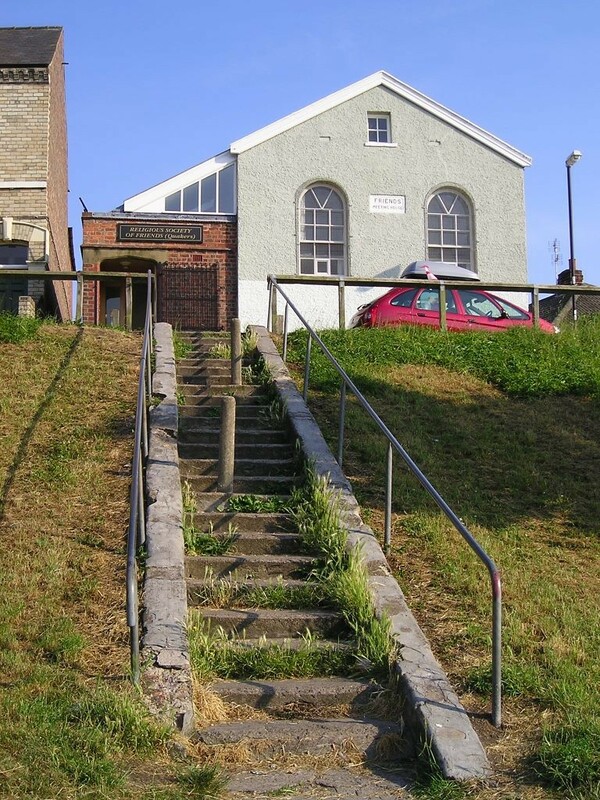 A Friends Meeting House in 2006 (originally a Primitive Methodist chapel, built in the 19th century) and still the same in 2016, though the land around it changes. Okay, the steps and the bin and the signage isn’t exactly beautiful, but this route across this land means a lot, so many of us have walked this way, down the weedy steps. The metal rails by the steps are just the same and so cast the same shadows, the staggered broken lines, in the high light of early July, ten years apart. No people in the 2006 view. 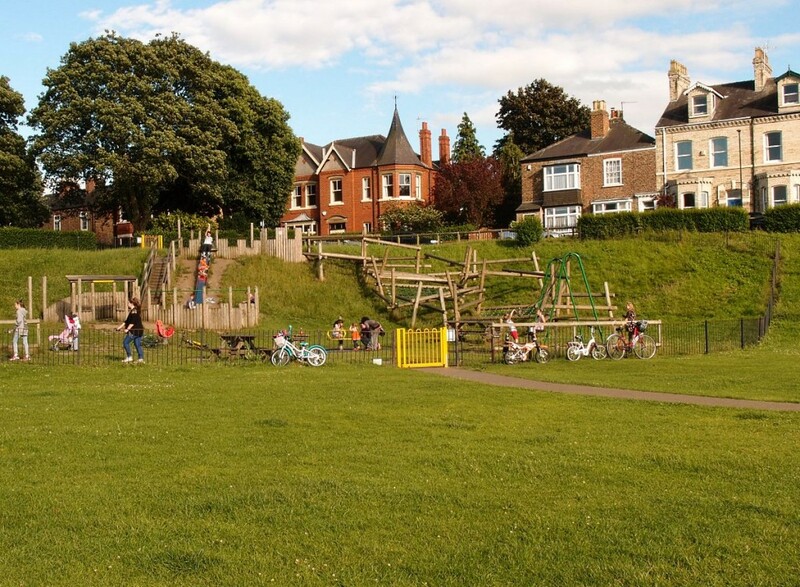 A busier Acomb Green in 2016. Perhaps, as I mentioned above, because it was a Sunday evening, or perhaps Acomb Green is generally busier most evenings. A young woman was sitting on the steps reading a book, and she smiled at me as I passed. 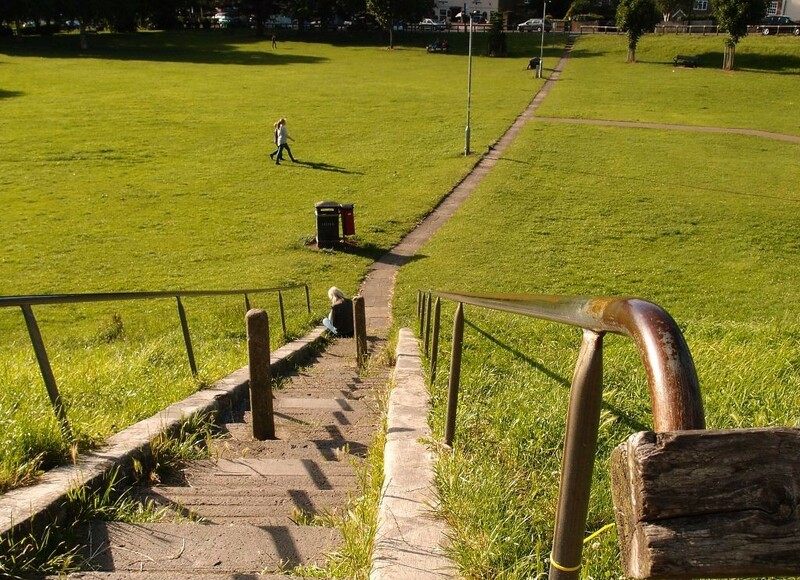 Forty years or more have passed since a very small me first went up those steps, probably holding my mother’s hand. And did so again, on the same evening in 2016. New play equipment, old shrubbery removed. Around it all the same old fence, touched by many hands, perhaps people leaning on it to look out across this open space, where maypole dancing used to take place, once upon a time. Above it all the church spire, and all those fine old trees. Behind us, alongside the Friends Meeting House, is an alleyway, where this wander continues. More on that story later. For now, I leave you with a link to an intriguing image of Acomb Green, painted long ago by an unknown artist and viewable on this link: Acomb Green: The View from My Window. It’s from the other side of the triangular green, a view not pictured in my photos. It wouldn’t be possible to replicate the view anyway, as it’s clearly from above street level, perhaps from a building no longer there. 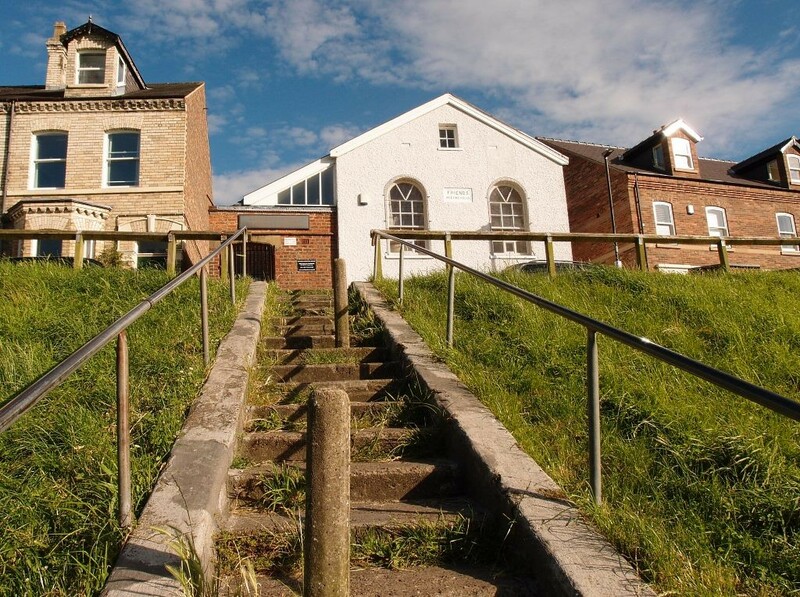 It’s said to date from 1880, but it doesn’t seem to include the Methodist Chapel/Friends Meeting House, which apparently dates from 1846. Another small mystery which, like the cattle trough, I’d like to investigate further, but can’t. Heading off towards the alleyway. Comments welcome, dear readers, as always. Lovely wording here from you Lisa and yes brings back memories from being a child and a teen, we must never forget our roots should we? Love Acomb, always will dunno if that is rose tinted glasses or not to be honest…. Went out early for a look at some old Acomb haunts, I swear I could still smell the Sunday roast! If you are interested in any photographs of York/Acomb I have a few as I am a photographer.